A trio of researchers from the University of Melbourne and the University of Life Science, Sydney, has found an isolated mammal species that lost its fear of predators in just 13 generations. In their paper published in the journal Biology Letters, Chris Jolly, Jonathan Webb and Ben Phillips describe their study of protected northern quolls living in Australia and what they found. As humans encroach on territory occupied by other species, those other species lose out. Often, the result is endangerment or extinction. That has been the case for northern quolls, which once inhabited large parts of northern Australia. After humans arrived, their numbers declined sharply due mostly to the introduction of invasive cane toads. To prevent their extinction, environmentalists captured several of them and released them on two small islands off the coast of Australia. That effort, it seemed, was a remarkable success as quoll populations soon soared on the islands. Pleased with their results, environmentalist tried to capitalize on their success by capturing a large number of the creatures and placing them back in their native environment. Unfortunately, the experiment did not go as planned. Over the span of just 21 months, most of the quolls were gone. This time, it was not poisonous toads causing their deaths, it was dingoes capturing and eating them. This came as a surprise to the team, because prior to the arrival of humans, quolls were able to survive in territory occupied by dingoes. They did so, the researchers note, by hiding from them. To better understand why the transplanted quolls fell victim to the dingoes, the researchers captured several of them from populations on the protected island and from locations where they had survived on the mainland. All of the quolls were put into cages where they could access a food source only by poking their snout through a hole in a box. Some of the holes were lined with dingo fur, or cat fur. In studying how the quolls behaved, the team found that those quolls from the protected island had no fear of sticking their snouts through predator-scented holes, showing that they had lost their fear of them—in just 13 generations. When imperilled by a threatening process, the choice is often made to conserve threatened species on offshore islands that typically lack the full suite of mainland predators. While keeping the species extant, this releases the conserved population from predator-driven natural selection. Antipredator traits are no longer maintained by natural selection and may be lost. It is implicitly assumed that such trait loss will happen slowly, but there are few empirical tests. 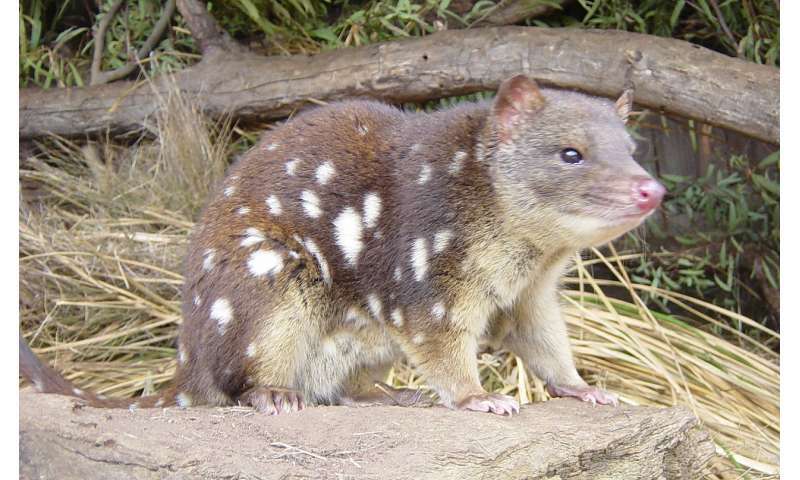 In Australia, northern quolls (Dasyurus hallucatus) were moved onto a predator-free offshore island in 2003 to protect the species from the arrival of invasive cane toads on the mainland. We compared the antipredator behaviours of wild-caught quolls from the predator-rich mainland with those from this predator-free island. We compared the responses of both wild-caught animals and their captive-born offspring, to olfactory cues of two of their major predators (feral cats and dingoes). Wild-caught, mainland quolls recognized and avoided predator scents, as did their captive-born offspring. Island quolls, isolated from these predators for only 13 generations, showed no recognition or aversion to these predators. This study suggests that predator aversion behaviours can be lost very rapidly, and that this may make a population unsuitable for reintroduction to a predator-rich mainland.